The waste presents unique challenges because there’s so much of it, and because it’s often laced with some pretty toxic stuff. The answer by and large is to bury the solid waste in municipal landfills – the same landfills that accept our household trash. A recent study conducted by the state’s Department of Environmental Protection says the practice is safe, for the most part. But many people are skeptical and worried about what’s going to happen in the long term. A few weeks ago I drove up along Cider Run road to the entrance of the Wetzel County landfill and pulled over. You can’t drive in unless you’re just dropping a load off, and the company that operates this facility didn’t respond to my requests to enter and have a look around. Save for the sign and the weigh station, it really just looks like any other back holler in West Virginia. The single lane road to the landfill follows a creek along a valley between forested hills that curve steeply up and away. Wetzel County Solid Waste Authority member, Bill Hughes, was with me. He also hasn’t been allowed into the facility, but he’s spent time at the entrance monitoring traffic. Hughes is a grandfather-of-nine who’s lived in the area for over 40 years. He’s been lobbying lawmakers and writing opinion pieces questioning the safety of how natural gas companies go about drilling and what they do with waste. Landfills that accept drill cuttings are required to have radioactivity detectors because waste rock and mud pulled from rock formations deep in the ground is often laced with radioactive materials. But Hughes and other people are worried that radioactive waste is getting into their landfill in spite of the detectors, and possibly leaching out. In response to concerns about the drilling waste, the legislature asked the DEP to commission a study. That study was released earlier this year. 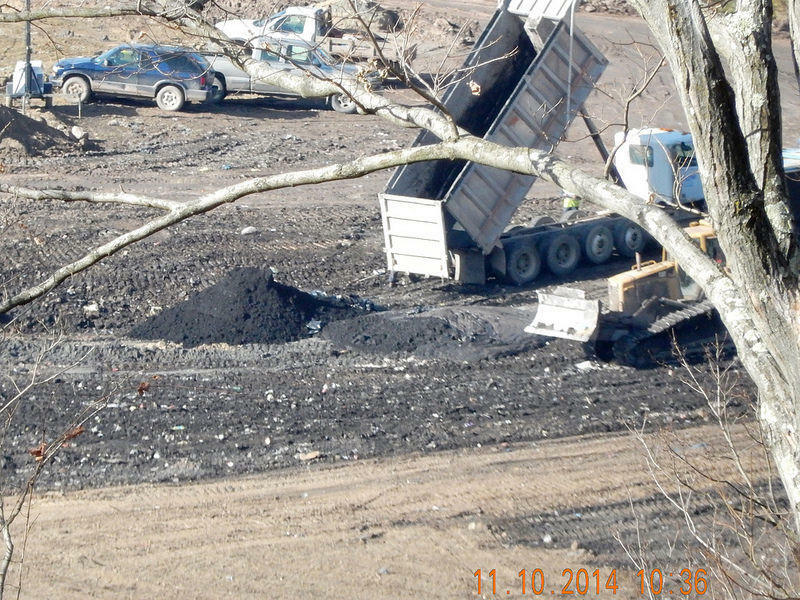 But it also found that the leachate is toxic, and that it does contain radioactive material. The radioactive material doesn’t go directly into groundwater or rivers, because there are multiple liners around the landfill. The liquid collects in those liners and is pumped out. It’s usually taken to a wastewater treatment facility. But the treatment facilities are not designed to accept industrial wastes. They’re owned by local governments and are the same places that treat sewage and other municipal wastewaters … waters which are then discharged into rivers. The DEP’s study demonstrates that these facilities are currently diluting the leachate to safe drinking water quality standards. But some people are still worried. “I want to refrain from being alarmist, but I will say that much of the data are alarming,” said Marc Glass, a remediation specialists who works for the Morgantown-based environmental consulting firm, Downstream Strategies. There are several different constituents in the waste that you might not want to tango with, among them is what’s called Naturally Occurring Radioactive Material or NORM. According to the World Nuclear Association, NORM is basically everywhere at low levels. It’s not like gamma radiation which can penetrate steel walls. NORMs are mostly particles that are unlikely to penetrate most any hard surface - even skin can be an effective barrier. This type of radioactive material is really only a harmful, cancer-causing agent if ingested - as in breathed in or swallowed. Water experts like Ziemkievicz are not overly concerned about current levels of radioactive waste being discharged into the environment, but they ARE worried about the long-term implications of current practices. Other experts are also concerned about accumulation, especially given the amount of waste we could conceivably generate over the next 30 years or more. Glass, over at Downstream Strategies, believes the DEP leachate study miscalculated how much waste will be produced in the future. About 16 hundred wells exist today, but about 4000 have been permitted. DEP anticipates another 5,000 to 15,000 wells are yet to be drilled. Glass says the DEP’s study indicates that West Virginia needs to reevaluate how we’re treating the leachate from landfill because it’s not effective, and he says we should expect that problem to get much worse as the scale of drilling increases. The DEP is recommending improved monitoring of leachate, groundwater and even water wells around landfills, but some groups don’t think the state can be trusted to handle the problem. The National Resources Defense Council and the West Virginia Surface Owners Association, among others, are threatening to sue the federal Environmental Protection Agency to force it to step in. The federal Environmental Protection Agency proposed a new rule this week that would regulate methane gas pollution in the oil and gas industry. Methane is a potent greenhouse gas and the Obama administration wants to see emissions cut in half over the next decade.